Commonly used antacids such as Prevacid, Nexium, Prilosec, and Protonix can impair kidney function, according to a 2017 article in the journal Kidney International. These drugs, known as proton pump inhibitors or PPIs, should not be taken long-term without monitoring of kidney function. Other antacids that work by blocking histamine H2 receptors do not interfere with kidney function but may not work as well as PPIs. Researcher Yan Xie and colleagues found that more than half of people who developed chronic kidney damage while taking PPIs showed no earlier acute signs of kidney dysfunction, meaning there may not be signs of kidney function loss until the damage is irreversible. Xie and colleagues suggest that patients and doctors should be more vigilant about monitoring the use of these medications, since waiting for outward signs of declining kidney function is not a reliable way of detecting damage. More than 15 million Americans use prescription PPIs to reduce gastric acid, bringing relief to heartburn, ulcers, and acid reflux. Millions more buy PPIs over the counter without consulting a doctor about their use. The study analyzed Department of Veterans Affairs data from 125,596 new users of PPIs and 18,436 new users of H2 blockers. 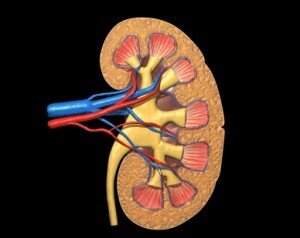 Acute, reversible symptoms of kidney damage, such as reduction in the urine being cleared from the body, fatigue, and swelling of the legs and ankles were seen in less than 20% of the PPI users. However, more than half of those who developed chronic kidney damage and end-stage renal disease never showed these warning signals beforehand. In contrast, only 7.67% of those taking H2 blockers had chronic kidney disease without acute symptoms, and 1.27% had end-stage renal disease, when kidneys can no longer clear waste from the body, and dialysis or a kidney transplant is required. Xie and colleagues suggest carefully monitoring kidney function in people taking PPIs, even when there are no outward signs of problems. They also suggest carefully evaluating whether PPIs are necessary, since the risk of kidney damage is serious.